March Hares and Mad Hatters are the order of this wonderful video slot game, offering you great rewards while taking yourself on an entertaining venture. This great video slot game will bring back memories as Mad Hatters five reel by thirty pay line game offers you features such as two different Wild and Scatter symbols. 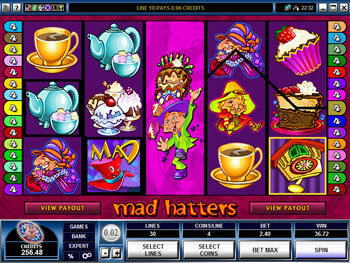 Wild Mad Hatters hats continue to substitute all symbols other than the scatter symbols through normal play, a second Wild Hatters symbol which you get to choose, substitutes in the Free Spins feature only, but also expands rewarding you with more opportunities to add to your payline win, and also substitutes for all symbols other than the scatter symbols. Three or more scattered March Hares in a hat could rewards you with up to 50 free spins, which can not be retriggered, whereas three or more scattered Cuckoo Clocks will open up a new screen where you have the opportunity to choose up to three symbols from as many as a possible five symbols, all of which have hidden bonuses. Our recommendation – a definite YES! The image of the Mad Hatters has been indelibly imprinted upon our minds ever since childhood when we sat cross-legged while having Lewis Carroll’s Alice in Wonderland read to us by our parents or grandparents. With the advanced technology of movies and then television, Walt Disney brought us the Hatters classic face and large felt hat. The Mad Hatters will live on not only in memory but also by his name on the signs in front of countless hat and novelty shops. Mad Hatters features will keep you in awe as you roll this five reel by thirty payline video slot while allowing your imagination to run away as you join in the tea party fun and games in this latest Microgaming’s new release. Maximum Jackpot – 20 000 coins x 10 coins per line = 200 000 coins in base game, 30 lines x 10 coins per line x 37 = 11 100 coins in bonus game, and 20 000 coins x 10 coins per line x 2 multipliers = 400 000 coins in Free spin game. What are the Mad Hatters Video Slot Paylines?